Posting times are a common topic between social media marketers and small business owners but is there really a one size fits all answer? When determining the best posting times for your business it’s important to look at your audience and engagement. Here’s a breakdown of the best social media posting times for each of the big networks, generally speaking. Facebook is undoubtedly the king of the social media world, but it can also be the most difficult platform to get your posts out organically. Facebook is constantly changing its algorithm which means the way your posts are shown to your followers is always changing. 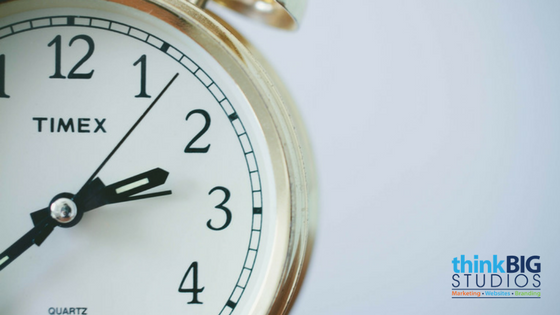 Posting at the right time is necessary to have maximum impact on your audience. These patterns are a great place to start when determining the best posting time for your page. Thursdays are the best day to post, and 1 pm tends to be the most active time of the day. While Thursday is the best day to post, Wednesday to Sunday are still shown to be effective. Twitter is one of the fastest ways to communicate with your target audience. Monday through Thursday are the best days to post on Twitter, and like Facebook, Thursday stands above the rest. Right at noon is the most active time during the week so for maximum impact consider posting at noon on Thursday. With more users turning to social media daily, engagement on this fast-moving platform is key for your business. Engagement matters every bit as much as posting at specific times, but consider engaging with your followers and influencers in your industry within the most active times of the day for maximum impact. Instagram is a powerful tool for business that is constantly growing to be one of the most popular networks. Instagram has the highest interaction rate so if you’re not on it now is the time to jump in. Monday to Thursday are all good days to post to Instagram with Monday’s delivering the best engagement. Almost anytime other than 3 pm is ideal Monday through Thursday with 2 am, 8 am and 5 pm standing out as the optimal times. Be sure to follow the 80/20 rule when posting content to your profile. 80% should be educational, empowering and helpful to your followers and 20% of your content can be promotional. Providing value to your followers will leave you standing out from the crowd in your industry with a long-term audience. Be sure to keep a close eye on your engagements, followers, likes, and reach through insight tracking tools. If you’re not sure where to start or are struggling to establish your social media, contact the team at Think Big Studios. We can help!